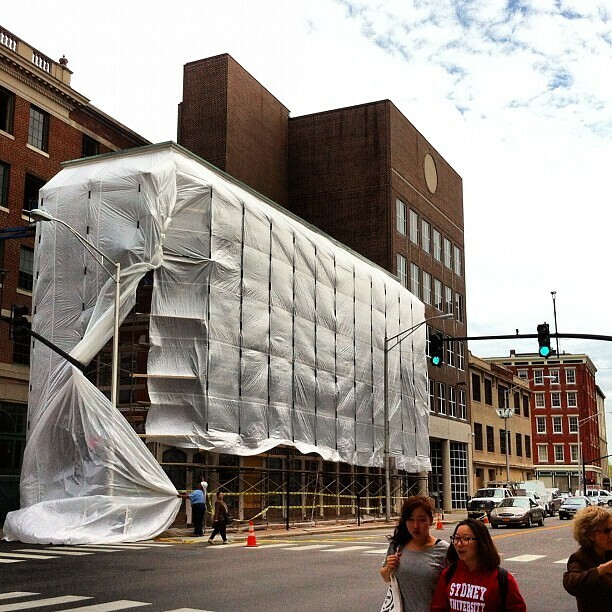 The ProvidenceG is a new development of one of the city’s most iconic historic buildings. Luxury apartment rentals are complimented by exceptional amenities and services as well as on-site fine dining and entertainment venues creating a truly unmatched lifestyle. PBN has an article (behind the paywall) today about the project. They report the project will include 52 luxury apartments expected to be ready for occupancy in October. There several restaurant/retail spaces available and there will be a rooftop bar. The old Narragansett Hotel Garage will have vetically stacked parking, apartments on the upper floors, and a rooftop pool. The project will also feature a fitness center for guests. This all sounds nice if you can afford it. Another PBN article today noted that the Waterplace development still only has 73 of the 193 units under contract. So it will remain to be seen if luxury living in Downtown Providence is a commodity people are interested in buying. Finally a rooftop bar in Providence! (Other than the occasionally-opened one above Gracie’s). Every city is what you make of it. I’ve lived in Boston, New York, and Providence, it is very easy to fall into a rut and be bored with your life in larger cities too. I only went to WaterFire once this year for a bout 15 minutes and only go to the mall when I need something but somehow I manage to have a fulfilling life in Providence. Maybe I’m easily amused or something. And why live in Providence if you work in Boston? I don’t know, why live in Warwick if you work in Providence? What kind of question is this? Or why live in Brooklyn or Hoboken when you work in Manhattan? Maybe because it’s cheap or friends live there or it has amenities you like or it’s fun. The Downcity rental occupancy rate has been around 98%+ for the last four years. Condos have a vacancy problem. The Capital Cove building was leased to J&W before they attempted to rent the apartments individually. The Westin and Waterplace were filled with renters, paying high rents, until the project owners decided to evict them. Where did all those people go, the East Side, Lincoln, or Warren? Demand for Downcity apartments will probably not be exhausted for a long time. So if a Downcity apartment is affordable for someone who works in Boston, where are the affordable Downcity apartments for people who live in Providence, the West Side or somewhere else? This is an outside developer if I’m not mistaken. That is usually a good sign if a developer from out of state believes there is a market here to invest in. And I completely agree that a city is what you make of it. I lived in Boston for most of my life before moving here and have found myself exploring so much more in Providence given its accessibility. Born in Pawtucket, grown up in Rhode Island and yes I’ve lived New York besides Rhode Island, so that must make me an outsider now. Peter, if that was in response to my post I think you misunderstood me. I was saying the company developing the Teste block building is not from Rhode Island… And that’s generally a good sign. If you weren’t responding to my post than i apologize and you can ignore this…. While it is good to reuse the Providence Gas building I regret that it is not a functioning gas utlity office building. When Providence Gas Co was locally owned, its CEO started Grow Smart RI to encourage more concentrated development more easily served by gas mains. Once sold to a Texas company and then “National Grid” (really should be called “Non-national grid” since it is owned by a UK corporation) they not only lost interest in smart growth, they do not even provide a place to pay utiltiy bills downtown! 52? Is it me, or are those going to be quite small “luxury apartments”?